Subject: The Purge: # 264 Revolver 2: Last Stand at Malpaso: This is like playing a Western movie. Jump on your house, grab your gun, and fight the bad guys. I have to admit in advance: I love westerns and the old west setting. I love the dirt, the good v. evil, the "old time clothes", the horses, and the shooting of guns. Every time a western is released, I run to see it (especially if Kevin Costner is in it). 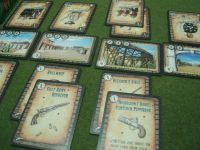 I like the Old West and if a game has that theme, I will more than likely buy it (Carson City is a family favorite). I will not apologize for this, but know that I am a tad bias. Yet, I will not like it if it is bad (Wild, Wild, West). With that said, this game is good and a real treat to play. This game really catches the theme of the old Western movies and puts you directly front and center of the movie plot. This game only plays two players: Good vs. Evil. White vs. Black. Town vs. Rebels. Padre vs. Outlaw. This was a game I almost didn't play because the rules were so darn hard to get through. The rules are horrible and make the game nearly unplayable. For some reason, I could not wrap my mind around this game. Yet, I moved forward and found a game I love. The game is simple, do not let the rules trip you up. The game is beautiful and the art work is great. The game is dripping with theme and plays like a movie. There is humor in the cards, but no too much. There is a lot of "take that" in the mechanics, but it is so integrated in the theme you won't care. Both sides play very differently and require totally different strategies. The game requires you to plan ahead. It is a card game so getting the right card at the right time is important, but the cards allow you to go through the deck at times, so the luck of the draw is mitigated. You will have hard decisions about when to play certain cards: do you save it to blow up the bridge later in the game or play it now as you desperately need the card. Other times, you will push your luck hoping you can get another ammo card later. And so goes the defending/attacking of a small town in Mexico. This game is a keeper for me. There is so much that comes through in this game. The game has a lot of take that and having the right card in your hand at the right time goes a long way. The game has flaws. Yet, I keep coming back to it. Both sides play different, so it is fun to learn the other side also. The components in the tin box are very good. Except that tin box. It doesn't stack well on my shelf and gets dented easily. I do like the 3D perspective on the box. In the tin, you get some cards that have a nice gloss, very good art work, and they shuffle well. The cards are going to see a lot of use and they should hold up without sleeving. You also get some neat green sombreros. They are used as trackers and are cute and a nice touch. 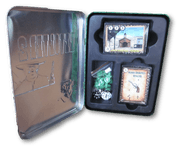 Everything in the tin is made of great quality and a lot of care went into this game. This is where the game and I have issues. This is a horrible rule book. It nearly made me not play the game. The book refers to things as one word and later it is called something else. It doesn't identify the components. It took me forever to figure out which cards where which person's (the marking is on the back of the card which I did not look at until I did by accident). Learning to play this game by the rule book is very hard. I'd recommend looking else where for a better rule set. The game isn't complicated, but the rules make it harder than it has to be. My goal is not to recite the rules. Instead, my goal is to explain how it feels to play the game. At the start of the game, one player is Good and one is Bad. The good player will set out his starting guardians and he will have a stack of guardian cards. The Guardians act as the good guy's hit points. If the the guardians die, the good guy loses. In addition, the bad guys will lose if the game ends via the time limit and/or the Mexican army shows up. Before the game starts, there is a mini game sort of like poker. Each player will randomly take a card out of their hand. Then, each player will play a card face down. Highest number wins. Some cards are lower, but give you an advantage during the game (-1 sombrero). There is a cheating card that will trump anything, except for the card that calls you for cheating. First person that wins 2 out of 3, places their 3 battlefield cards and thus gets an advantage in the game. 1. Move the timer forward -- This is represented as a wooden token moving forward. Some spots are mandatory and others are optional. Normally, the good guy will be able to place a new guardian out for the first three cards. 3. Play Cards -- This is the main mechanic of the game. There are six battle fields placed at the start of the game. The good guy can play up to three people on his side of the battlefield (this becomes his defense). You can play as many cards as you want (some kill people, etc). 2. Play cards -- The main difference is the bad guy can play as many cards as he wants on his side. 3. Attack -- The bad must attack each time and kill someone or the Mexican army moves one spot closer. To attack, the bad guy adds up the score his players on his side of the battlefield and misuses the defense of the battlefield and the defense of the good guys there. If his number is greater, he kills one guardian. The game is really that simple. The rule book is not clear on what is going on and does not really organize things that well. If you can follow this outline and add a few more rules from the game, you should be able to play within minutes. Most of the play back and forth is from the text on the cards. Not everything is included in the book, but BGG answers a lot of questions and so will common sense. Yes! If you ever have a chance to play a two player game, this is a fantastic choice. If you like Westerns or Old West movies, then you will likely love this game. The game is rather cheap, so buying it before playing will not break the bank. I really do like this game. I do not think I will play it all the time, but a monthly game would do just fine. The next day after playing it we were talking about revenge and how we would play differently. That is a sign of a good game. As a two player card game, I cannot recommend this game enough. The theme shines through and it is fun. People will die and you will lose cards, but that is part of the game and the theme. Keeper. I really hope you enjoy this game! Thanks for the great and thorough review! Most appreciated! So is this a totally separate game from Revolver? What about the 1.1-1.4 expansions? If I want to get into this game series, or get it for a gift, should I go for Revolver and expansions or Revolver 2? The expansions are not interchangeable, Aaron. Revolver #2 is a separate game. I can't recommend which one to get, it's like choosing between your children, for me!